Biopharmaceutical companies with limited experience in rare-diseases are increasingly looking to launch rare-disease drugs. There is also growing interest from early-stage companies in using the rare-disease pathway as a step to becoming fully integrated biopharmaceutical companies. These companies may have developed expertise in research and development of rare-disease indications, but lack insight and experience in launching a drug with a rare-disease indication. For these companies, it is important to understand and invest in preparation to achieve launch success in the rare-disease market. In preparing to launch a rare-disease medication, it is important to understand the needs in the therapy area and invest strategically so as to maximize available resources and impact on the unique rare-disease environment. This article provides a framework for identifying the needs in a rare-disease therapy area, as well as another to prioritize investment for launch excellence and success. A case study is then provided to show how a biopharmaceutical company has successfully met the needs of a rare-disease therapy area. The launch of a medicine is a complex operation to carry out, and a significant number of launches fail to meet their presales expectations1 . Furthermore, the quality of a drug’s launch impacts its financial performance well beyond the initial launch phase2 . Inability to assess and understand the needs and wants of the market is listed as one of the main reason for productlaunch failures3 . Having supported numerous pharmaceutical companies in their product launch preparations, we have identified an important approach to apply in unveiling insights on the needs in the rare-disease market. 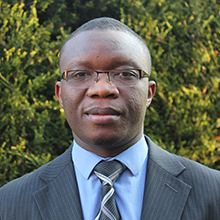 For common and well-understood diseases with existing treatment options, much of the healthcare infrastructure to support the successful launch of a medicine is in place, as many patient needs are already met to a large extent. With rarediseases, the picture is completely different. In many cases, the biopharma company has to develop a deep understanding of the needs in the therapy area before identifying ways to build the infrastructure needed for launch success. 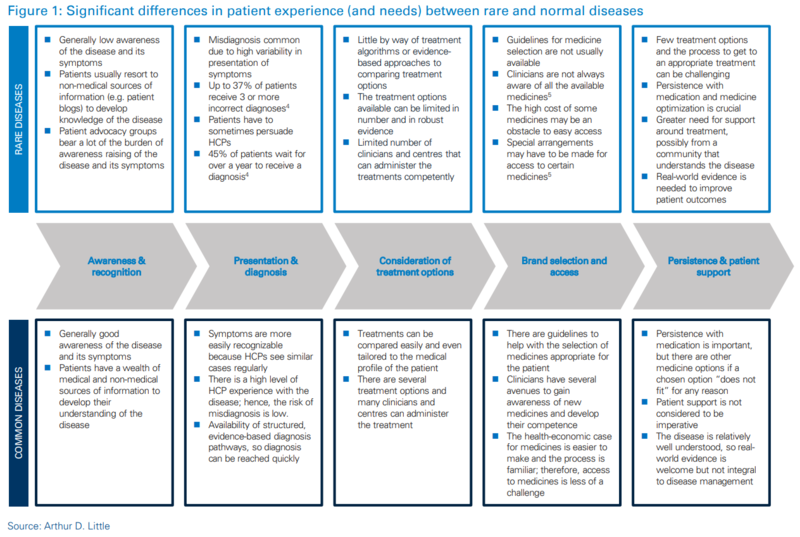 One way of understanding needs in a rare-disease area is to follow the patient treatment pathway and compare the state of affairs in a typical rare-disease area with what exists in a common-disease area. The information needed to conduct such as exercise can be readily gathered by interviewing key opinion leaders (KOLs), healthcare professionals (HCPs) and patient access groups (PAGs). On a common disease patient treatment journey, patients transition from disease awareness and recognition to presentation and diagnosis by HCPs. Treatment options are then considered, a treatment is selected, and a brand best suited to the patient’s needs is chosen (if there are multiple brands to choose from). The patient then follows an access pathway to secure the medicine, and takes it over a period of time (with assistance or support if applicable) to achieve improvement in health outcomes. Compared to common diseases, rare-diseases have very low awareness among members of the public and HCPs. This is because the incidence of the disease is very low, and therefore most people will not have heard of it. In addition, Primary Care Physicians get little or no training on these diseases. A lot of the information available on these diseases is provided by patients on blogs or internet sites that have not been medically vetted. Awareness creation for the disease falls mainly to PAGs. The genetic variability of many rare-diseases results in highly variable presentations, which lead to increased difficulties in making the correct diagnosis. In some cases, several symptoms must be aggregated for a professional to come to a diagnosis of the rare-disease. Unfortunately, these symptoms may be presented to different specialists who may not suspect the presence of the rare-disease, and hence may not look for the other confirmatory symptoms to diagnose it. This can lead to a significant delay in receiving a correct diagnosis compared to timescales for diagnosing common diseases; in cases where a quick and accurate diagnosis is achieved, the patient often enters a period of intense effort to understand the condition and the treatment options. All of these can cause a lot of distress and suffering for the patient and their family members. In many cases, the treatment options for rare-diseases may be very few, with limited evidence to support selection and few specialists and treatment centers available to provide treatment. The treatment centers tend to be tertiary centers or academic medical centers; hence, they cover large geographies. This may mean significant travel for the patient to receive appropriate medical attention. Rare-disease medicines are usually expensive and for a relatively small number of people. It means access frameworks may need to be set up – in some cases on a patient-by-patient basis. In addition, reimbursement negotiation may be challenging, as the usual formula for calculating reimbursement may not apply. Furthermore, there may be no agreed guidelines or algorithms for brand selection, and therefore a wide variety of prescribing processes and treatment outcomes. While persistence and patient support may not be necessary with common diseases, they are a big consideration for rarediseases due to the low patient numbers and the significant medical issues patients and their caregivers confront. To maintain persistence, a number of patient-support provisions need to be proactively put in place. In addition, collection of real world evidence is usually a key feature in the study of rare-diseases, as the data collected can be used to gain insight, provide a resource for ongoing support systems and ultimately, be used to continuously improve patient outcomes.